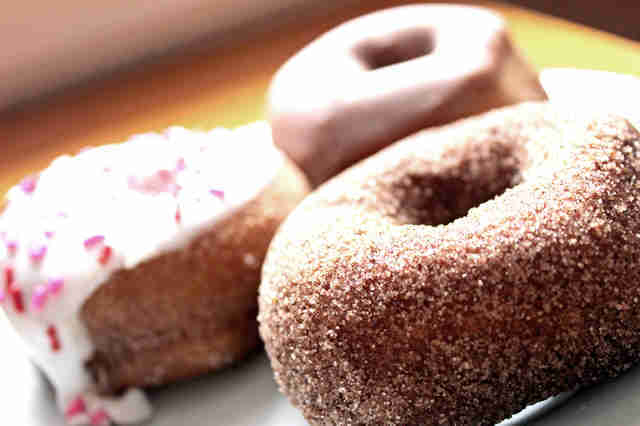 There's an old adage that states, "The best donut is the one you're eating right now." And while it's certainly a quaint and folksy saying, unless you're eating a donut from one of these seven Twin Cities places, it's patently false. We’re not exactly sure if this is a real deal donut shop, a crazy experiment, or some kind of drug front, but honestly, their donuts are actually good, so either way they seem to have a pretty viable business plan given their campus location. 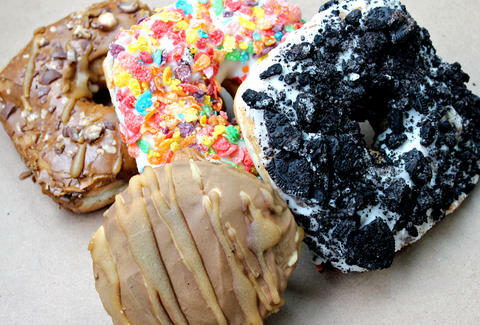 With offerings like the Oh Fu$ck Yeh!, the Gay '90s, the Big ‘D’, and Oprah Money, you have to wonder what exactly was going through their minds, but we’ll be damned if it wasn't making delectable donuts. We particularly took to the ‘No Flex Zone’ which comes topped with vanilla frosting and crushed Oreos. Located in an unassuming strip mall directly next to a bike shop sits SugaRush. They sell a variety of lush classics, like their apple fritter which is studded with huge amounts of delicious cinnamon, but their classic vanilla donut is where it’s at. It’s light and airy with a velvety vanilla frosting which helps to make every single bit an absolute pleasure. There's a very realistic chance we would've included these cats on name alone, but it turns out their donuts are phenomenal too. 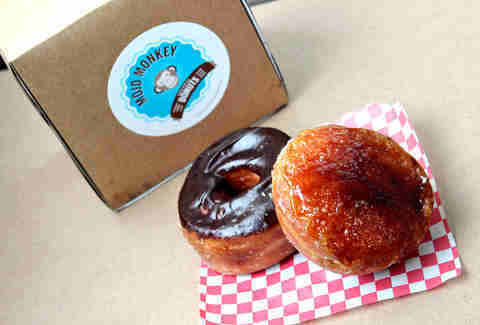 Cakes, raisers, crullers, fritters, bars, Danishes, beignets, bismarks... they make every type of donut imaginable (though not necessarily at once, so check their donut-making schedule before you go). This time around we went for the crème brûlée bismark, which was, without a doubt, a do-not-miss. While they offer a variety of fan favorites, including their peanut butter Sriracha donut (or the femme fatale, which comes stuffed with raspberry curd and topped with vanilla cream), for our money, if you’ve got the option to bacon-up your morning pastry, you do it. End of story. 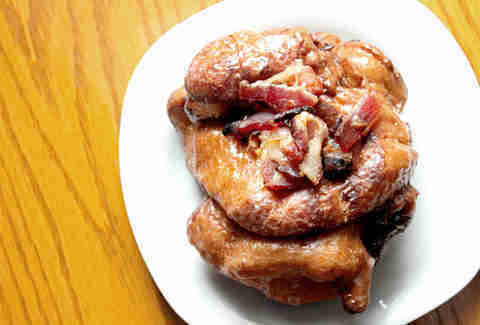 Throw some bourbon into the mix and you’ve hit pastry nirvana, which makes this apple-bourbon-bacon fritter (also known as the Pin-up Girl) breakfast perfection. You can also get them bacon free, but seriously, why would you go and do something like that? 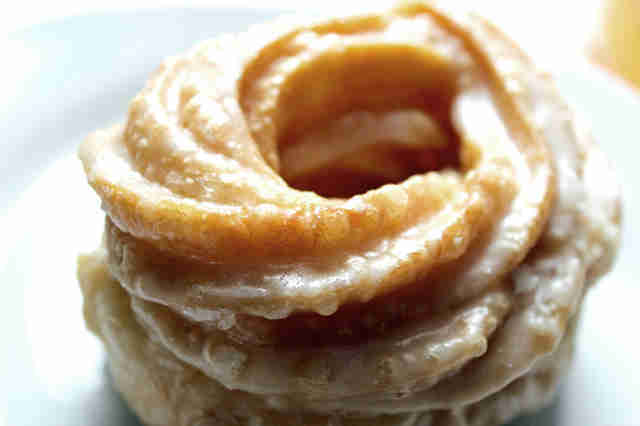 When it comes to light and airy, this cruller from Downtown's sainted bakery is the best in the city. Its crisp outer exterior gives way to some of the lightest and flakiest pastry that we’ve ever had the heavenly pleasure of sinking our teeth into. One taste and you'll feel blessed. 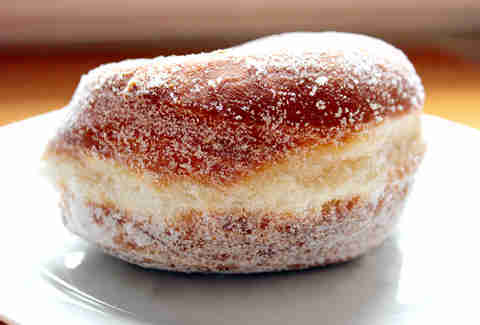 When it comes to filled donuts, this one is the champ. Hands down. The fluffy, airy, brioche dough lends itself almost a little too well to the vanilla bean buttercream jammed inside. Roll the whole thing in some granulated sugar and hot damn; you’ve got yourself a thing of beauty. 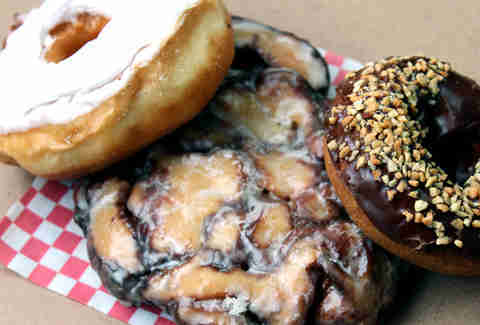 This is, by far, the gold standard for donuts in the Twin Cities. While they offer a variety of delectable edibles, what it all comes down to is the simple little round confection that is their cake donut. Topped with a bit of frosting and a smattering of sprinkles, or tossed in cinnamon and sugar, they somehow manage to remain not overly sweet and make the perfect companion to a cup of coffee. They also ring in at around $.50 a pop, so they’re the best value by a long shot. Keane Amdahl is a veteran Twin Cities food writer that probably needs to have his blood sugar checked after scouring for donuts. Follow his sweet antics on Twitter @FoodStoned.